- "Nawazuddin Siddiqui in Space Part 1"
I know. strange comic. strange title. This 3 part story has been in my head from a really long time. I originally wrote it for the ANTARIKSH TALES anthology by Kailash Iyer. But It didn’t happen and I couldn’t hold it any longer, so I am just putting it out. I’m sorry that the title character appears only at the end. Well, this is just the first part. Nawazuddin Siddiqui as it appears in this comic is just an exaggeration of the characters he has played. I do not claim to represent the real person. There’s more of him in the next part. Sir Ji.. chhaa gaye !!! 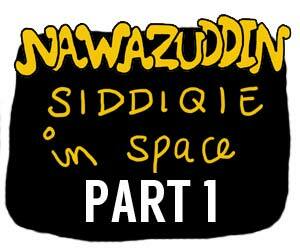 sir, who is Nawazuddin Siddique? Mere school main maths teacher thi Mrs. Siddique, unka beta hai kya? monica ram denny ,,, sabka balda lega reh tera phaizal.